On June 27-29 UNESCO team comprised of Mr.S. Lazarev, Director of UNESCO Almaty Cluster Office, Mr.G.J. Kim Regional Director of UNESCO Bangkok, Mr.F. 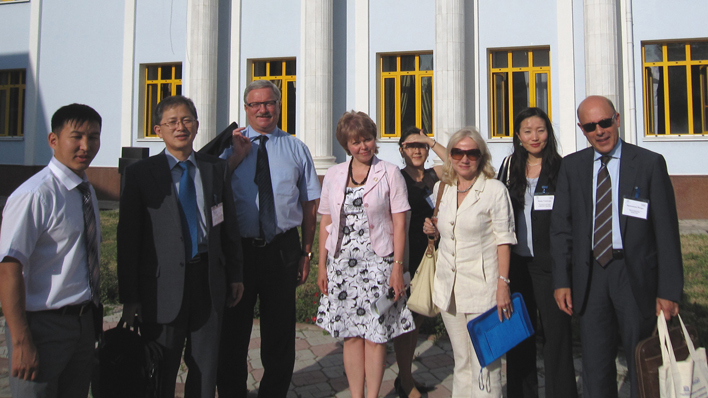 Pedro form HQs Paris Policy Advice section, and UNESCO Bangkok and UNESCO Almaty education programme staff undertook an official visit to Kyrgyzstan. UNESCO continues supporting Kyrgyzstan in their attempts to review education system with the focus on the post conflict situation. According to Kyrgyz President’s request and with reference to the political crisis of June 2010 the needs in the field of education were raised in terms of support to education system review with focus on post conflict areas in Kyrgyzstan. The country requires urgent reforms to boost stability and peace through large-scale interventions in the education sector. There is a need to get an overview and revision of national education strategies and plans of action in line with country education system needs and requirements. This process is hindered by budgetary restraints, shortcoming in the area of effective legislation, infrastructure, equipment and supplies, qualified staff and training. With this regard UNESCO organized in Bishkek the workshop on Education Monitoring and Evaluation for education policy makers from Central Asian countries. The participants were introduced to strategic principles of results based planning, monitoring and became familiar with education evaluation models and tools. The training and evaluation modeling will provide a base for further development of countermeasures in education policies. At the workshop the key findings from EFA Global monitoring report 2011 were presented to address the needs of the education in conflict affected countries. During UNESCO team’s mission the meetings with government officials, Ministers of Education, Youth Affairs, the National Commission of the Kyrgyz Republic for UNESCO, NGOs, development partners and international organizations were organized to consider mutual commitments and contributions to the education system review in Kyrgyzstan. UNESCO Almaty Cluster Office proposed to conduct in Kyrgyzstan, as one of the post conflict countries in Central Asia, the International Forum on post conflict education, based on one of the UNESCO’s pillars “Learning to Live Together”. The Forum will aim to support education initiatives and collect best practices in the context of disaster and conflicts prevention from the Central Asia countries and will provide opportunity to identify, debate and discuss priority issues in different areas of post conflict education, as well as the network for seeking common solutions to problems arising in the post conflict situation. UNESCO initiative will play an active role to joint efforts in the rebuilding of education systems in conflict-affected areas and manage existing challenges. Training for Photographers "Social Aspects of HIV and AIDS in photograph"